We at Galco perfectly understand that the need for innovation in the public sector has never been greater. Citizens are expecting customized and real-time services. Our range of of products and services was specifically built with the needs of Public Sector employees in mind. 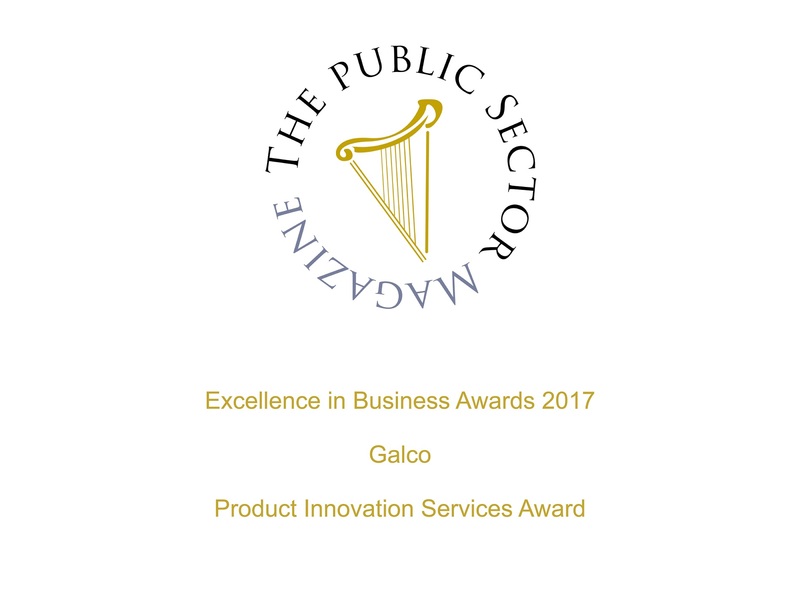 Galco`s dedication to serving the Public Sector for over 50 years makes it deserving of the award for “Product Innovation Services”. We are absolutely delighted and honoured to receive this award which we gratefully accept. Putting customer first is a strong mantra we have engrained in our company. Galco`s range of products and services was specifically built with the needs of Local Authorities in mind. This includes ChipFill®, hot applied surface defect repair system, Premark® anti-slip thermoplastic solutions and Galvacoat®, specially formulated single application paint system that offers you low maintenance, cost savings and a multitude of applications. Galco worked closely with Dublin City Council on this project to come up with a solution to the health and safety risks they faced while repairing these cobbled streets using previously approved methods (pouring of hot bitumen). After discussing the main areas of concern, we agreed on a suitable product from the range of thermoplastic solutions we offer – Chipfill. 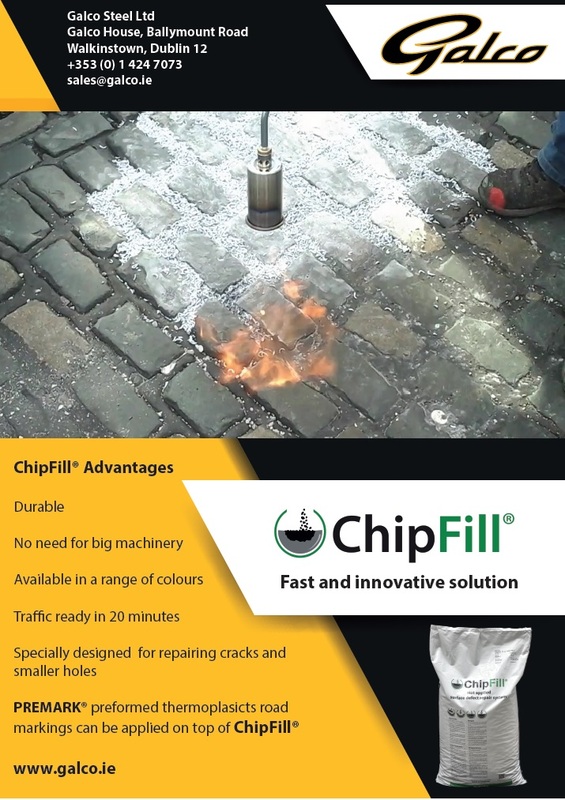 ChipFill® is a granular thermoplastic crack in-fill system that can be used as a grouting, potholes repair or as a surface defect repair solution. With the ease of installation and simplistic finish, this product best met the needs of the project. Newer and better technology is also driving the paint industry, and nowhere is this more evident than in the formulation of Galvacoat® – a specialist product that’s designed to provide exceptional adhesion to galvanized steel. Not only does it solve the problem of adhesion, over its lifetime cost, it saves hugely on other methods, as it involves just a single application. In terms of its aesthetic effectiveness, it preserves 95% of the selected colour for up to 20 years. That’s a very long time not to have to worry about repainting! Another huge benefit, of course, is that in our less than predictable Irish weather, only having to apply it once means that Galvacoat® can have you in and out before the weather gets a chance to change its mind. Add in the fact that Galvacoat® has very strong U.V resistance and anti-graffiti properties, along with being available in the full RAL colour spectrum, and you can see how painting galvanized steel has never been so easy. 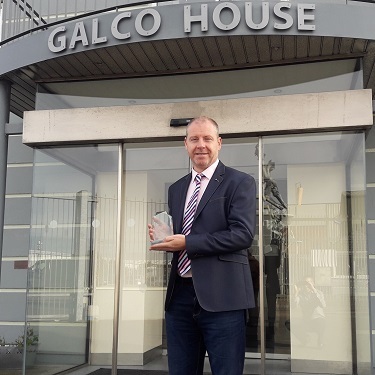 Galco have been at the forefront of the galvanizing industry in Ireland for the past 50 years. Through this time, we have built up a core understanding of what is required by our customers. With a wealth of experience and our strategically placed state of the art plants located around the country the quality and turn around we offer are of the highest standard. Galco are also a leading provider of surface water management solutions for modern urban landscapes. We supply a wide range of Access Covers and Drainage Systems. With an in-depth understanding of the market and technical support we can provide the complete drainage package for all needs and applications.